Take Another Look at the Heart Art Card Kit & Joyful Heart Bears Before Making Them Yours Tomorrow! We have one more day to preview our Heart Art Card Kit, and Joyful Heart Bears stamp set & Die-namics before they’re available for purchase tomorrow morning. Today we’re sharing even more inspiration and a handy PDF download. You can enter to win by commenting on each of the two countdown posts on the MFT Blog before 8 PM EST on January 21. Please leave only one comment per person, per day. One winner will be randomly selected from each countdown day, and both winners will be announced at 10 AM EST on January 22 on the MFT Blog. As a reminder, this coordinated collection will be available as a single purchase product — no need to commit to a long-term subscription. The purchase price for this kit is $39.99. In addition to the Heart Art stamp set, Heart Trio Shaker Window Die-namics, and Double the Love Die-namics, you’ll receive a package of Heart Trio Shaker Pouches and twelve sheets of coordinating card stock. If you’d prefer to purchase the products individually, you can do that too! The Heart Art PDF features card samples as well as a complete listing of the kit contents. You can download a printable version HERE. In addition to our January card kit, the newest design from Stacey Yacula will also be available for purchase. The Joyful Heart Bears trio is simply irresistible — what a charming addition to your lovey-dovey image and sentiment options! Stephanie put Heart Art to work for this week’s episode of MFTv. Candy hearts are the quintessential candy of Valentine’s Day and this month’s kit is the ideal starting point for creating a modern twist to this candy classic. The latest Free with $60 makes an appearance as well — something to think about as you plan your order! Watch this week’s episode of MFTv, Stamped Candy Hearts featuring the Heart Art Card Kit on YouTube or watch the video below. To be entered into the weekly drawing, be sure to leave a comment on this video on our YouTube channel – the winner will be selected from there! 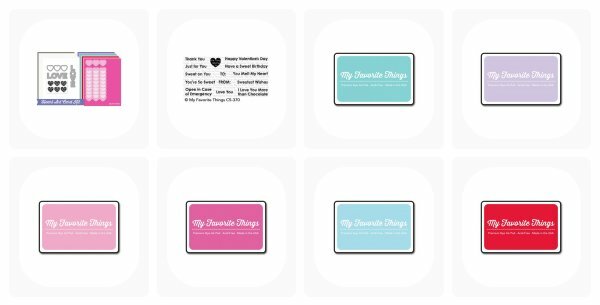 Click through to each of our Design Team member blogs to see what they’ve created with the new January card kit and the Joyful Heart Bears stamp set & Die-namics. Remember, all of our mid-month release products will be available tomorrow at 10 AM EST! The little bears are darling. What a sweet and fun card kit! Adorable and creative inspiration projects. I love this kit and the cards with the candy hearts are adorable. Super pretty card kit for celebrating love! And the bears … so adorbs! Great job ladies. Such a sweet release. What a beautiful collection! And I love the cards made using it. I like the candy hearts. I still can’t get over how insanely cute the little bear set is!!! I simply MUST have it! Fabulous kit! And lovely creations! Gorgeous cards Ladies! MFT hits it out the ball park again! I adore this new kit & all the sample cards! Those bears are just adorable but the candy hearts are my absolute favourite! I am totally in LOVE with this kit. And I’ve managed not to buy all of the new release items yet so I have a few left to add to this order and I can hopefully get the sweet free w/60. I have set my alarm, have my credit card handy, I am r-e-a-d-y MFT, you just rock!!! Valentine’s Day cards are hard for me to make. Love this kit to have it all together in one spot. Beautiful samples! Love this pretty kit! What an awesome kit of LOVE…..
Great cards…thanks for the video can hardly wait to get my kit! Love the little mini heart shakers and the Kit is a winner! great samples – awesome kit!!! Great tutorial! I love the hearts with messages. Such a sweet Valentine’s mit. Love the great DT work. Great sentiments on the hearts! I love Stephanie’s colorful and quick cards! Loving all the hearts and Stacey Yacula’s Joyful Heart Bears Stamp Set! This kit looks like so much. And I definitely want the adorable little bears. Beautiful cards! I love the bears! A truly lovely set of cards from the design team. Looks like a fabulous kit! The little bears could warm anyone’s heart!! Can’t wait to see all of the lovely things this team will do with this set! What a fun kit! Lots of possibilities! Stacey Yacula has designed more cute critters. Love them. I love hearts! I love shakers! This is the best of both worlds! Fun! Fabulous cards by the members of the MFT Creative Team! I really like the heart stamps – an updated version of conversation hearts. Love Stephanie’s rainbow hearts – so very pretty. I am totally loving those Stamped Candy Hearts! So Fun! I’m in serious love! I really adore the stamp hearts… Those sentiments are so sweet! Another cute card using this very cute card kit. Love the colors, especially the brighter ones!! Love anything and everything with hearts! I love the font inside the little hearts. Projects are so inspirational and the Heart Art card kit is just awesome!! Looking forward to tomorrow. Can’t wait to get my hands on those little bears.